Parker’s is equipped with a 35 ton travel lift and a 6-cylinder Hercules Pettibone crane. 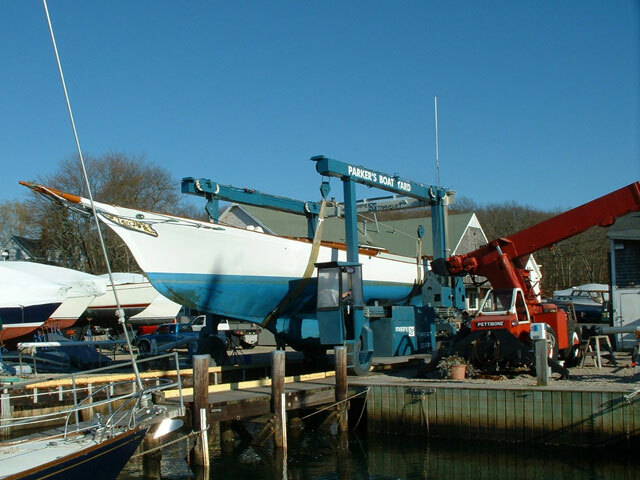 Haul outs with the travel lift can be easily arranged to perform repairs or provide hull inspections. Ask about our summer mid-season haul and wash specials! Bottom washes are provided using the latest water recycling technology. Additional information on our Pressure Washer Recycle System is listed under the Environmental Policies tab. Boats that are stored elsewhere but are looking to be launched and serviced at Parker’s should be aware that there is a black out period, meaning no trucked-in boats will be launched from May 1st until mid-June. During this interval, we will be focusing on boats stored in our yard. Please be sure to schedule your launch around these dates.